Virtualization and the shift to cloud computing continue to refocus market demand. Revenue in the worldwide server market decreased -2.2 percent year over year to $10.9 billion in the first quarter of 2014 (1Q14), according to the latest market study by International Data Corporation (IDC). This is the fifth consecutive quarter that the server market has experienced a year-over-year decline in worldwide revenue. Server unit shipments improved 2.1 percent year over year in 1Q14 to 2.1 million units as investments in hyperscale datacenter capacity were largely offset by consolidation, which continued to be a strategic focus for many large and small customers around the globe. On a year-over-year basis, volume systems experienced 3.9 percent revenue growth. 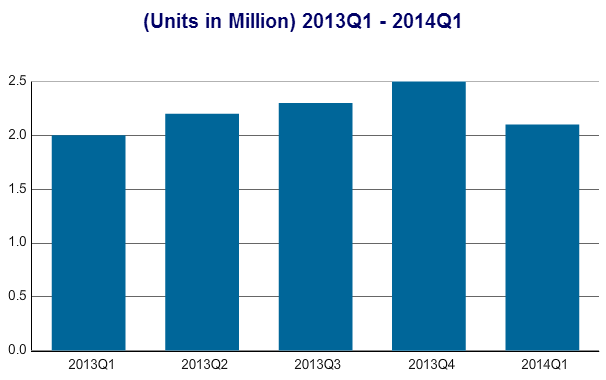 This was the fourth consecutive quarter that volume system demand increased year over year. At the same time, demand for midrange and high-end systems experienced year-over-year revenue declines of -4.8 percent and -25.6 percent respectively in 1Q14. The midrange and high-end markets were impacted by difficult year-over-year comparisons combined with transitions in the technology refresh cycles typical for these segments. "The server market continues to be heavily influenced by mobile, cloud, big data, and social enablement drive significant hyperscale server deployments globally," said Matt Eastwood, group vice president at IDC. At the same time, traditional client-server workloads continue to drive investment in private cloud facilitation as traditional SMB and enterprise customers drive consolidation and automation deeper into their environments. The net effect is an increasing concentration of computing power into fewer and larger enterprise and service provider data centers around the world. Demand for x86 servers improved in 1Q14 with revenues increasing 4.9 percent year over year in the quarter to $8.9 billion worldwide as unit shipments increased 2.5 percent to 2.1 million servers. HP led the market with 29.6 percent revenue share based on 0.4 percent revenue growth over 1Q13. Dell retained second place, securing 22.0 percent revenue share. Non x86 servers experienced a revenue decline of -25.2 percent year over year to $2.0 billion representing 17.9 percent of quarterly server revenue. This was the eleventh consecutive quarter of revenue decline in the non-x86 server segment. IBM leads the segment with 57.2 percent revenue share following a year-over-year revenue decline of -31.0 percent when compared with the first quarter of 2013. Blade servers, which are highly leveraged in enterprise's virtualized environments, increased 2.3 percent year over year to $2.0 billion. Blades now account for 18.0 percent of total server revenue. HP maintained the number 1 spot in the blade server market in 1Q13 with 43.7 percent revenue share; Cisco held the second position in the blade market with 24.4 percent revenue share; and IBM held the third position with 12.3 percent revenue share. Density Optimized servers, utilized by large heterogeneous data centers, experienced weaker demand in 1Q14. Revenue declined -10.8 percent year over year in 1Q14 to $649 million as unit shipments decreased -6.0 percent to 215,567 servers. Density Optimized servers now represent 6.0 percent of all server revenue and 10.4 percent of all server shipments.